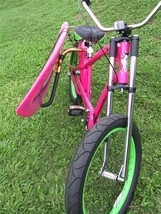 The Sidecar bike surf rack allows you to carry your board on the side of your bike, which is a safe and easy way to get around town with your board (we carry 2 versions of the sidecar rack). The Rear Storage bike surf rack totes your board at an angle facing up in the rear but is sure to keep your tail off the ground! 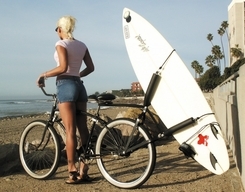 Check out all of our surf racks for bikes - and ride on!